A luxurious elite club in the heart of the social hub near to the bustling & vibrant lokhandwala Complex in Andheri west. Located near infinity mall, The Classique Club features comfortable and decent rooms equipped with air-conditioner, television, intercom facility, well-appointed bathrooms & other modern amenities. The hotel like club houses three food joints. Tangerine a multi-cuisine restaurant serving Indian and global cuisines. An inhouse Shooters Bar and a Poolside restaurant to savour and unwind. Close to Mumbai airport (10 km) the hotel is well-suited to business and leisure travellers. 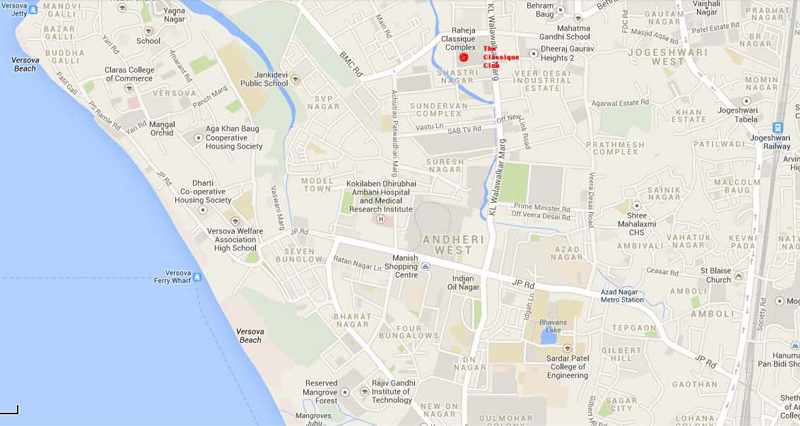 It is near to major commercial areas like Laxmi Industrial estate in Andheri and Mindspace in Malad among others. The club is in close proximity to the film and television industry like Goregaon filmcity, Balaji telefilms, Yash Raj Studio, Shri adhikari brothers etc. Multiplexes & Cinemas like PVR, CINEMAX & Fame Adlabs are within walking distances. The Club is surrounded by major shopping areas & malls like The Infinity mall, Citi mall & Lokhandwala shopping street.